A pirate welcomes guests: Medieval Torture collection...Yikes! St. Augustine, founded in 1565 by Spanish explorers, is the oldest continuously occupied city in the continental U.S. The historical relevance of the earliest U.S. explorers coexists with an active music, arts, and night-life scene today. 1. Castillo de San Marcos Fort : Completed in 1695, while Florida was still part of the Spanish Empire, is the oldest masonry fort in the continental U.S. Built of local Florida stone, coquina, it is mostly compressed shells. The porous formation has withstood everything from cannon-ball shots to hurricanes. 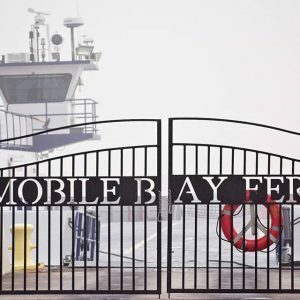 Located on Matanzas Bay, views from the fort are of the bay and it’s marina, Lion’s Gate Bridge connects to Anastasia Island, the Atlantic Ocean, and old downtown. The Lower level offers comfortable walking and is wheelchair accessible. The fort built by the Spanish withstood many conflicts and hurricanes due to the limestone/shell mixture-coquina. 2. Spanish-Colonial Quarter: Stroll along the brick streets, shop, eat ice cream, enjoy a craft beer, all while soaking up the ambiance of the colonial era architecture. A pirate looms over one balcony, inviting visitors to his museum. Hidden jewels of interest are found in side alleys/unique shops with walls covered in vines and embedded sea shells. 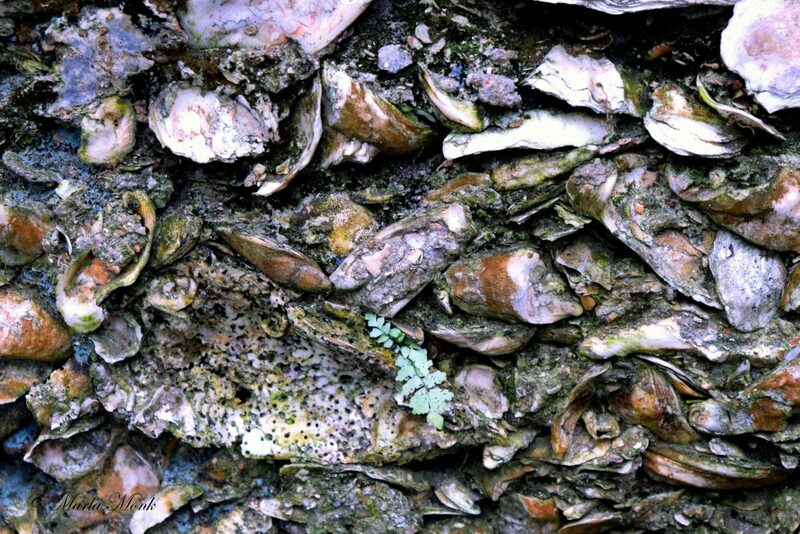 Oyster shells embedded in the walls in the Colonial Quarter alleyways. 3. 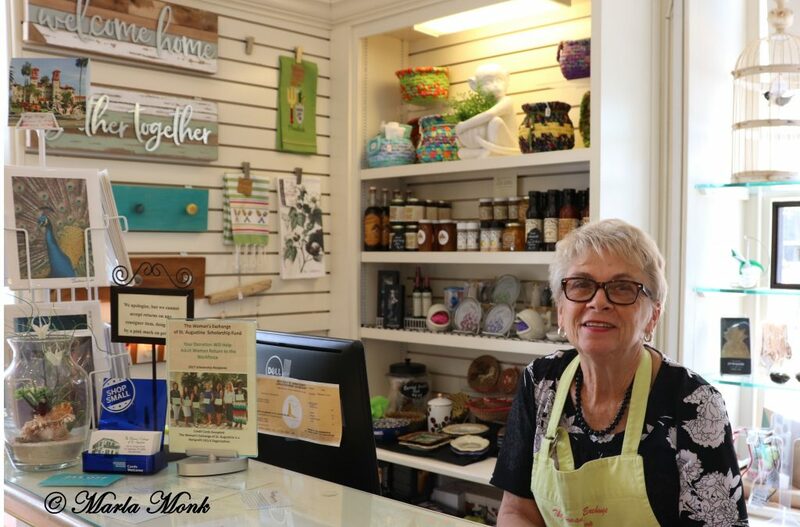 The Pena-Peck House: Home to the Women’s Exchange Gift Shop, it was founded in 1892 with the Logo “Women Helping Women.” The shop helped women who had fallen on hard times regain economic stability by placing their fine quality handcrafted items for sale to wealthy visitors to the “American Riviera.” Over 100 consignors still provide quality handcrafted items , along with other merchandise in the gift shop. I liked some beautiful hand-made clutch purses and baby items. For a donation only, daily docent tours of the Pena-Peck house give a historical view of an antebellum home. 4. 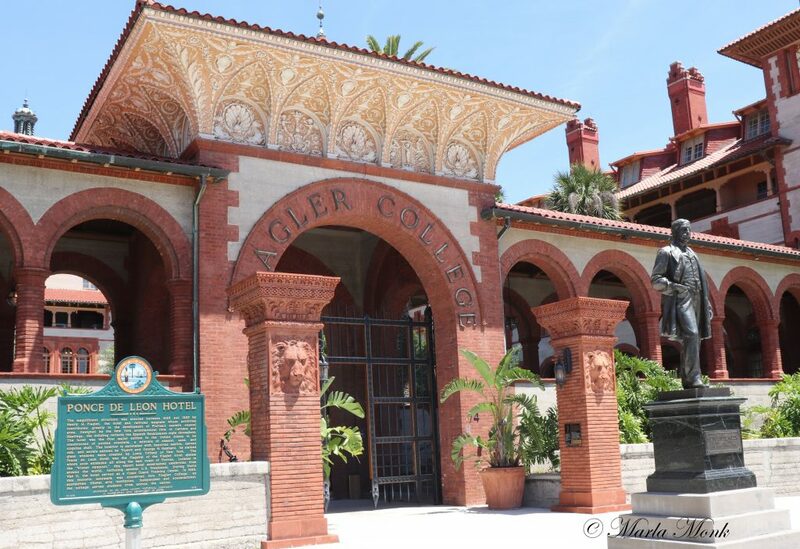 Flagler College: The impact of Henry Flagler on the development of St. Augustine is incredible. 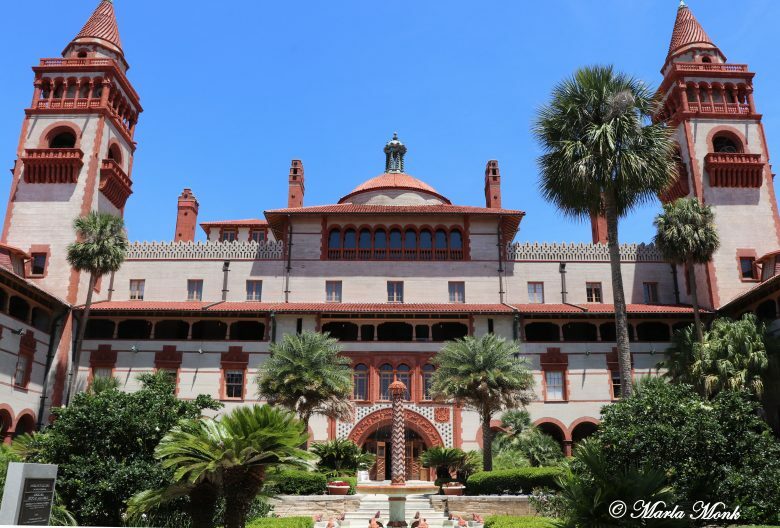 Flagler College’s dormitory and cafeteria are what was first the luxury hotel built by Henry Flagler in 1888, The Ponce de Leon Hotel. Henry Flagler, co-founder of the Standard Oil Company, built two luxury hotels in the city, The Ponce de Leon and The Hotel Alcazar, as winter resorts for wealthy Americans from the north, hence the area being named the “American Riviera.” He extended railroad lines into the area, forming the Florida East Coast Railway and built a railroad bridge over the St. Johns River, opening the Atlantic coast of Florida to development. 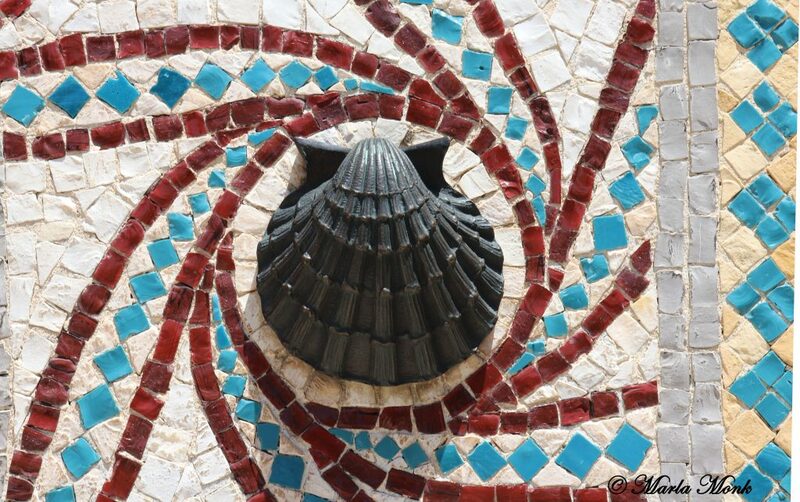 The Ponce de Leon Hotel/ Flagler College used a progressive architecture, the first of its kind constructed entirely of poured concrete, using the local seashell-stone coquina. Equally progressive, it was one of the first buildings in the country to be wired for electricity using DC generators installed by Flagler’s friend, Thomas Edison. Students at Flagler College have the privilege of looking out of their dormitory windows onto a courtyard, complete with frogs spewing water into a fountain and inlaid sea shells in the tile walls. The interior lobby is resplendent with carved wooden pillars and an ornate domed ceiling. 5. Memorial Presbyterian Church: Built by Henry Flagler in 1890 as a memorial to his daughter who passed away as a result of childbirth in 1889. 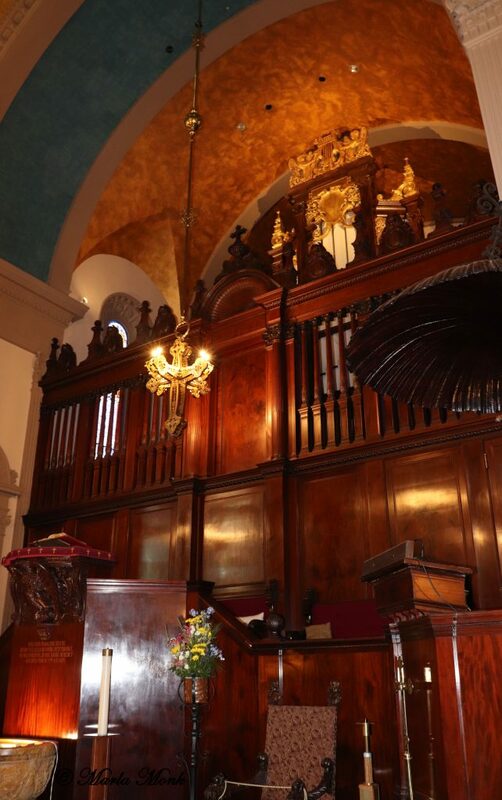 The church has its original gas lighting fixtures and hand-carved mahogany pews, doors, and altar area. The dome is adorned with Christian symbols. 13 of the 92 stained glass windows contain the statements of faith in the Apostle’s Creed. Other windows use religious symbols and samples of nature found in Florida. The 5000 pipe organ is used for services and special events. The Venetian Renaissance style was inspired by St. Mark’s Cathedral in Venice, Italy, with small tiles in the floor of Italian marble. The pulpit lectern of carved mahogany baptismal font, a solid piece of marble, are sights to behold. Henry Flagler and his first wife, their daughter and her baby are entombed in the Flagler Mausoleum in an interior room, reminding the visitor of the solemnity and devotion intended by the creation of the church. 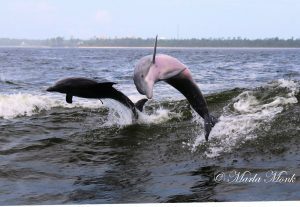 Visiting St. Augustine for a long weekend or as a stop while traveling farther south is well worth the time. You might just discover a piece of history or an era you can imagine yourself in. If you look closely, perhaps you’ll find a seashell or two. 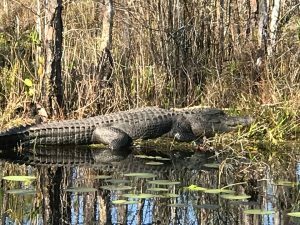 (Scroll through the thumbnail pictures at the top of the page for more photos of the beautiful city).